Download "The State of Working Florida 2007"
2 RISEP Research Institute for Social and Economic Policy at the Center for Labor Research and Studies Florida International University Miami, FL Phone: Fax: Website: Contact Information: Emily Eisenhauer Bruce Nissen Additional copies of this report are available on the web at: Special thanks to the Economic Policy Institute for supplying much of the data contained in this report, and to Marcos Feldman, Robert Ford and Yue Zhang for extra data analysis. 3 State of Working Florida 2007 Executive Summary RISEP s annual Labor Day report The State of Working Florida looks at the performance of Florida s economy with a focus on how working men and women are faring in employment, wages, benefits, and other aspects of work life. This year s report finds that employment and wages have improved, while benefits for Florida workers continue to lag behind most other states. Report highlights: Unemployment, especially long-term unemployment, continued to drop in After the recession of 2001 unemployment rose through 2003 but has since been steadily decreasing. Underemployment, the percentage of workers who are employed part-time involuntarily or discouraged from looking for work, has dropped since 2004 but is still not back to 2000 levels. Job growth has continued to speed up since 2004 but still has not caught up with population growth since The Construction industry has had the largest growth over the past six years, followed by Professional and Business Services. Manufacturing and Information continue to lose jobs. The largest industries in Florida, with the exception of government, pay close to or below the state average wage. Professional and Business Services, Education and Health Services, pay no more than 10% above the average, while Retail Trade and Leisure and Hospitality pay at least 30% below the average. The average wages of some higher paying industries in Florida such as information, financial services and manufacturing are 10-20% lower than the U.S. average. Compared with the U.S., Florida has higher percentages of employment in Professional and Business Services, Construction, Leisure and Hospitality, and Retail Trade, and lower percentages of Education and Health Services, Government and Manufacturing jobs. The median wage in Florida for all wage-earners 18 to 64 years old was $14.31 per hour in 2006, which was 97% of the U.S. average. Florida s median wage ranked 27 th in the nation. The lowest wage group, the bottom 10% of earners, is the only Florida group with an hourly wage higher than the national average, likely due to the raising of the minimum wage above the federal minimum. In Florida, the top 10% of earners earn more than three and a half times what the bottom 20% earn, and the gap has been widening for several decades. Over the long term wage inequality has grown much faster in Florida than in the U.S., but over the short term the reverse has been true. 4 Overall women in Florida are able to make choices about their employment situation and are faring as good or better in employment compared with men. Women are less likely to be in the labor force than men, and those who are in the labor force have similarly low rates of unemployment to men. More women work part-time, but fewer work part-time involuntarily. However wages for women continue to lag behind men. In Florida women earned 86% of what men earned, compared with 82% in U.S. Hispanics and Blacks/African American are not doing as well in employment and wages as white non-hispanics. More Hispanics and Blacks are in the labor force than whites, more are unemployed, and more are underemployed. In addition, fewer are employed part-time although a higher percentage of part-time workers are part-time involuntarily. The wage gap for Blacks and Hispanics has grown. In 1979 Blacks in the U.S. earned 82% of what Whites made, compared with 78% in In Florida Blacks earned 81% of what Whites earned in 1979, compared with 75% in Hispanics in Florida earned 85% of non-hispanic whites wages in 1979, but by 2006 the percentage had decreased to 76%. In the United States the gap is larger: Hispanics earned 81% of Whites wages in 1979, and 70% in Florida has 11.5% of the population living below the poverty line, compared with 12.3% of the U.S. population. However Florida has a slightly higher percentage (31.1%) living below twice the poverty line, than does the U.S. (30.5%). Florida consistently ranks near the bottom in benefits for workers. Florida ranks 44 th out of the 50 states and the District of Colombia on working-age population with employer based healthcare coverage, and 50 th in the percent of private sector workers with pension/retirement plans. Florida also ranks low in unionization rates at 45 th in the nation. In 2006 unionized workers in Florida earned 1.35 times what non-union workers earned, making $18.94 per hour compared with $14.02 per hour for non-union workers. Floridians pay roughly 30% of income in taxes, 11 th highest in the nation. But Florida ranks 35 th in state and local tax collections as a percent of income. Comparing average wage, wage growth, and job growth, the southwestern and southeastern coastal areas seem to be doing the best, in the southwest due mostly to job growth and in the southeast to higher wages. Jacksonville scored above average on each indicator. The areas that are at the bottom on these three indicators, mostly because of lower wages which may reflect lower cost of living, are smaller cities like Daytona Beach, Lakeland, and Tallahassee. Ft. Myers had the fastest job growth, adding 26.7% since Job growth there was split evenly between high- and low-wage industries. Port St. Lucie had the fastest highwage job growth, and Gainesville had fastest low-wage job growth. A major public policy issue this year in Florida is property tax reform, and we recommend closing sales tax loopholes and instituting a property tax circuit breaker. These measures protect working families from being squeezed by rising property taxes and maintain funding for needed services such as education and transportation that benefit all Floridians. 6 STATE OF WORKING FLORIDA 2007 I. How is Florida s Economy Doing? Jobs that provide good wages and benefits to workers are the basis of a good economy. We measure the success of Florida s economy by how well it creates these kinds of jobs, the percentage of people of all genders and racial/ethnic groups who are able to take advantage of these jobs, and the quality of life that jobs provide. 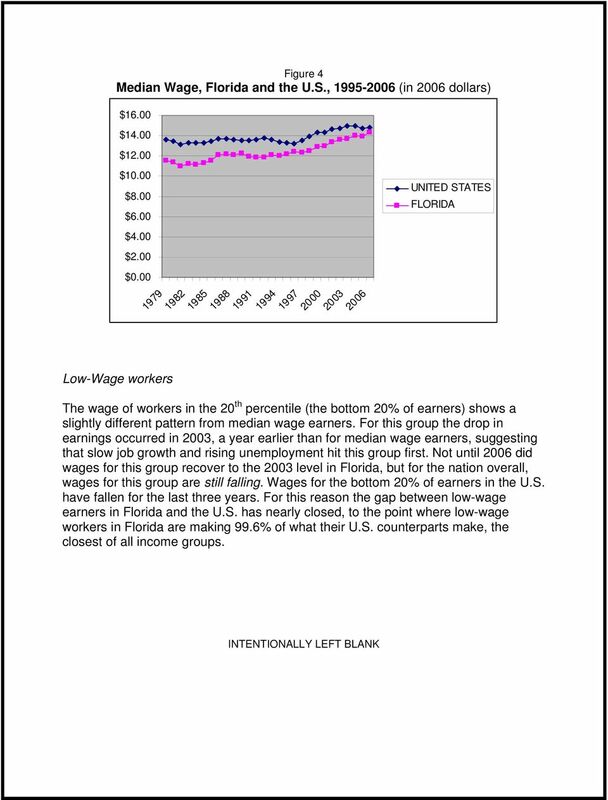 In 2006, Florida s economy improved in job creation, unemployment, and wages, continuing the pattern over the last several years of improvement in these indicators after the discouraging trends of the early 2000 s. Although unemployment remains relatively low, wages are also low, and the income gap continues to widen. Florida s employment and wages mirror the national pattern in the recovery from the recession of : while productivity and GDP were rising, employment fell, unemployment rose, and real wages fell 2. Wages and job quality for women, African Americans and Hispanics continues to lag behind. On Labor Day 2007, as a falling housing market brings instability to the financial markets, it is uncertain whether the country will experience another recession. But already in Florida tax receipts have been decreasing, forcing budget cuts at state and local government and making it harder for working families to access social services that supplement Florida s often low incomes. Thus the picture of Florida s economy, while bright for some, is increasingly dim for many more. In some areas of the state where the income gap is particularly wide, lower income and middle class residents are leaving the state seeking higher wages and a lower cost of living. The question for Floridians and lawmakers is: what kind of jobs will ensure a livable, workable economy? II. Are there enough jobs? Generally speaking Floridians have been able to find work and Florida s unemployment rate has been low compared with the nation since 1995, although the percentage of long-term unemployed and underemployed remains a concern. The nation experienced a recession in 2001 when GDP slowed, employment dropped and unemployment increased. However contrary to previous business cycles, during the recovery from the 2001 to 2003, employment continued to decrease and unemployment rose. 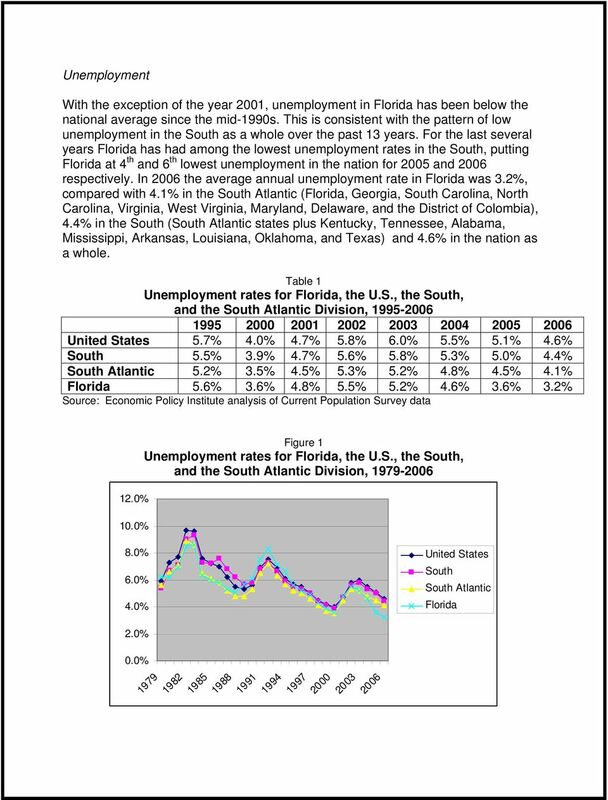 In 2004 unemployment began to slowly come down, and Florida s job market improved faster than the nation s. Unemployment, especially long-term unemployment, took a significant drop in 2006, a good sign for Florida workers. 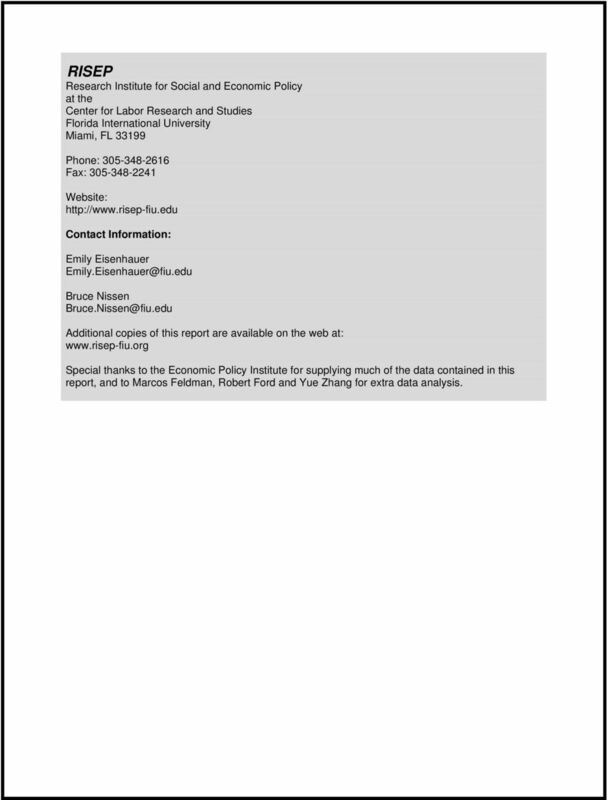 1 For a detailed description of the 2001 recession see the National Bureau of Economic Research, 2 For a comprehensive analysis of the nation s economy, see The State of Working America (2006) from the Economic Policy Institute. 10 Finally we combine workers who are working part-time involuntarily with unemployed workers classified as discouraged 3 or conditionally interested 4 to arrive at estimates of the share of workers who are underemployed, meaning willing and able to work but not able to find full-time work or perhaps any work at all. In Florida in 2006 the underemployed rate was 6.2%, compared with a national average of 8.2%. The same pattern can be seen as in the previous unemployment and part-time employment data a decrease from 1995 through 2001, an increase through 2003 and a decrease over the last several years. Whether this trend of decreasing unemployment, part-time employment and underemployment continues will depend on the health of our national and state economies. Table 5 Underemployment Rates for Florida, the U.S. the South, and the South Atlantic Division, Percentage-point change United States 10.1% 7.0% 9.6% 8.9% 8.2% -3.1% 1.5% -0.9% South 9.8% 6.9% 9.2% 8.6% 7.9% -2.9% 1.7% -1.1% South Atlantic 9.3% 6.2% 8.5% 8.1% 7.3% -3.1% 1.7% -1.3% Florida 10.2% 6.5% 8.3% 6.9% 6.2% -3.7% 2.2% -2.0% III. Are new jobs being created? After the last recession in 2001 the nation experienced a jobless recovery productivity and GDP grew very fast, but employment dropped and unemployment rose. In contrast, Florida continued to create jobs, albeit slowly, in the period after the recession. But although job creation has picked up in recent years, it still has not recovered to meet working age population growth since before the last recession in 2001 (Table 8). Labor Force Participation Not only did unemployment rise from 2001 to 2003 but labor force participation fell sharply, signaling an especially severe time for Florida workers. Since 2004 however labor force participation in Florida has increased, while the nation is only beginning to show a small increase. 3 Persons not in the labor force who want and are available for a job and who have looked for work some time in the past 12 months but who are not currently looking because they believe there are no jobs available or none for which they would qualify. 4 People who are marginally attached to the labor force but are not in the labor force for reasons other than discouragement (e.g. people who want a job but aren t looking because of child care problems). 11 Table 6 Labor Force Participation Rates for Florida, the U.S, South, and South Atlantic, 1995 to 2006 Percentage-point change United States 66.7% 67.1% 66.0% 66.2% 0.6% -1.3% South 66.0% 65.9% 64.7% 65.2% -0.2% -1.1% South Atlantic 65.8% 66.1% 64.9% 65.7% 0.5% -0.6% Florida 62.1% 62.6% 62.2% 63.5% 0.8% 1.4% Figure 3 Labor Force Participation Rates for Florida and the U.S, 1979 to % 68.0% 66.0% 64.0% 62.0% 60.0% 58.0% United States Florida 56.0% 54.0% 52.0% 50.0% Job Creation Comparing job growth and working age population growth tells us how the economy is doing at creating jobs for Floridians. Employment in Florida grew very slowly in the first few years after the recession of 2001, and has since picked up speed (Table 7). Florida has preformed better than the nation at creating jobs since 2001: where the nation as a whole lost employment from 2001 to 2004, Florida continued to grow at a slow pace. However, job growth has still not caught up with working age population growth since the last recession. In 2006 there were roughly 1.2 million more working age Floridians than in 2001, but only 800,000 more jobs. The working age population (16 to 64 years old) grew by 12.6%, while employment grew by only 11.1% (see Table 8). If job growth had kept pace with population growth we would have over 90,000 more jobs than currently exist. 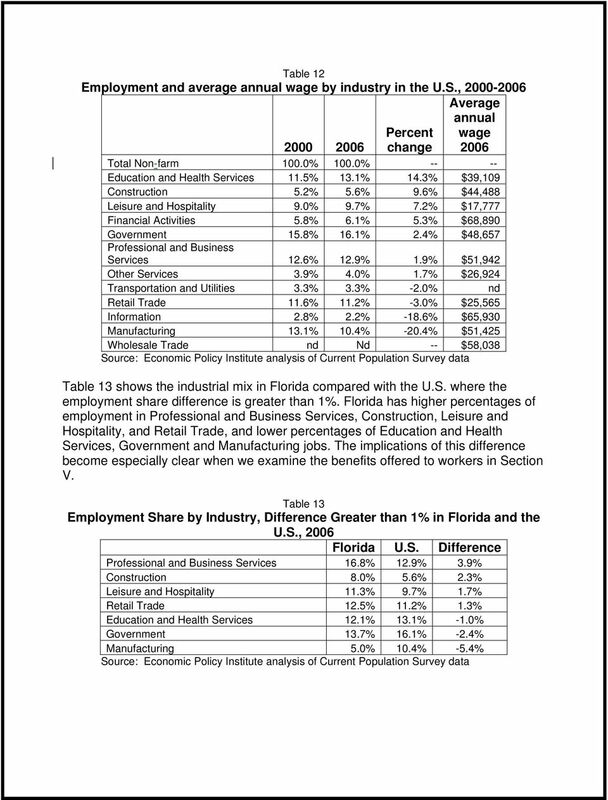 13 Table 9 Employment by Industry in Florida, 1990 to 2006 (in thousands) Percent Change Percent Change Total Non-farm % 13.3% Total Private % 13.9% Professional and Business Services % 21.2% Construction % 46.1% Education and Health Services % 19.0% Other Services % 14.7% Financial Activities % 17.9% Wholesale Trade % 10.7% Leisure and Hospitality % 13.9% Trade Transportation and Utilities % 6.6% Retail Trade % 7.1% Government % 9.6% Transportation and Utilities % -0.6% Information % -11.0% Manufacturing % -13.1% Durable Goods % -10.4% Non Durable Goods % -18.4% Employment and Wages by Industry in Florida For some time Florida s industrial mix has been tilted towards low wage industries, although recent years have seen faster growth in middle income industries such as Education and Professional and Business Services. The top five paying industries in Florida employ 30.3% of the population, while the bottom five employ 48% of the population. 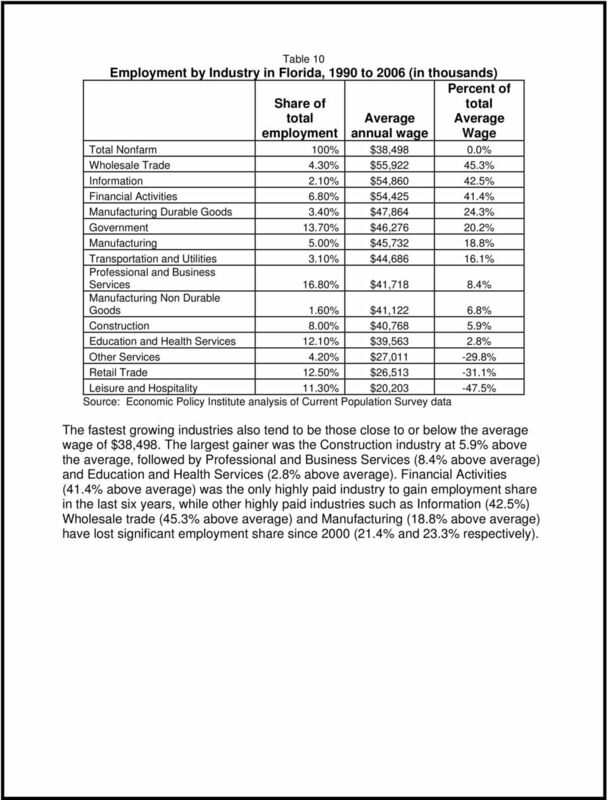 The largest industries, with the exception of government, pay close to or below the state average wage. Professional and Business Services, Education and Health Services, pay no more than 10% above the average, while Retail Trade and Leisure and Hospitality pay at least 30% below the average. 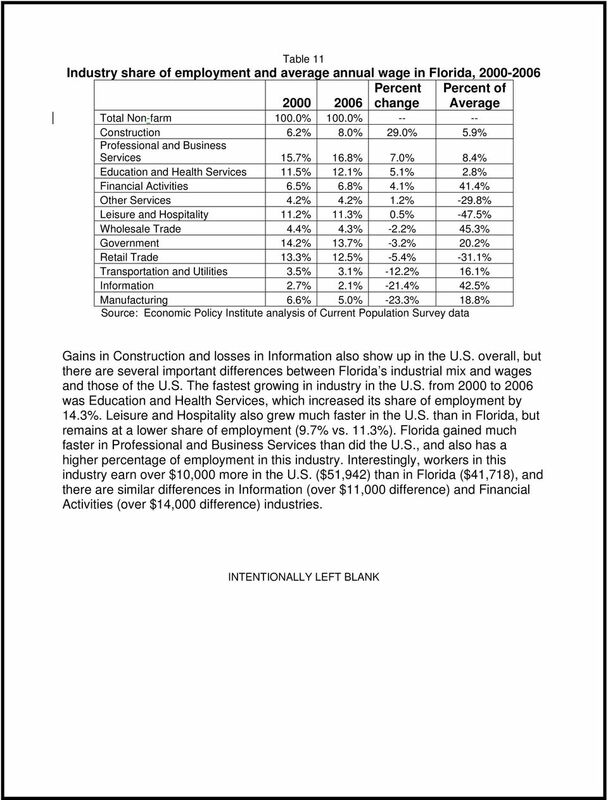 14 Table 10 Employment by Industry in Florida, 1990 to 2006 (in thousands) Percent of Share of total employment Average annual wage total Average Wage Total Nonfarm 100% $38, % Wholesale Trade 4.30% $55, % Information 2.10% $54, % Financial Activities 6.80% $54, % Manufacturing Durable Goods 3.40% $47, % Government 13.70% $46, % Manufacturing 5.00% $45, % Transportation and Utilities 3.10% $44, % Professional and Business Services 16.80% $41, % Manufacturing Non Durable Goods 1.60% $41, % Construction 8.00% $40, % Education and Health Services 12.10% $39, % Other Services 4.20% $27, % Retail Trade 12.50% $26, % Leisure and Hospitality 11.30% $20, % The fastest growing industries also tend to be those close to or below the average wage of $38,498. The largest gainer was the Construction industry at 5.9% above the average, followed by Professional and Business Services (8.4% above average) and Education and Health Services (2.8% above average). Financial Activities (41.4% above average) was the only highly paid industry to gain employment share in the last six years, while other highly paid industries such as Information (42.5%) Wholesale trade (45.3% above average) and Manufacturing (18.8% above average) have lost significant employment share since 2000 (21.4% and 23.3% respectively). 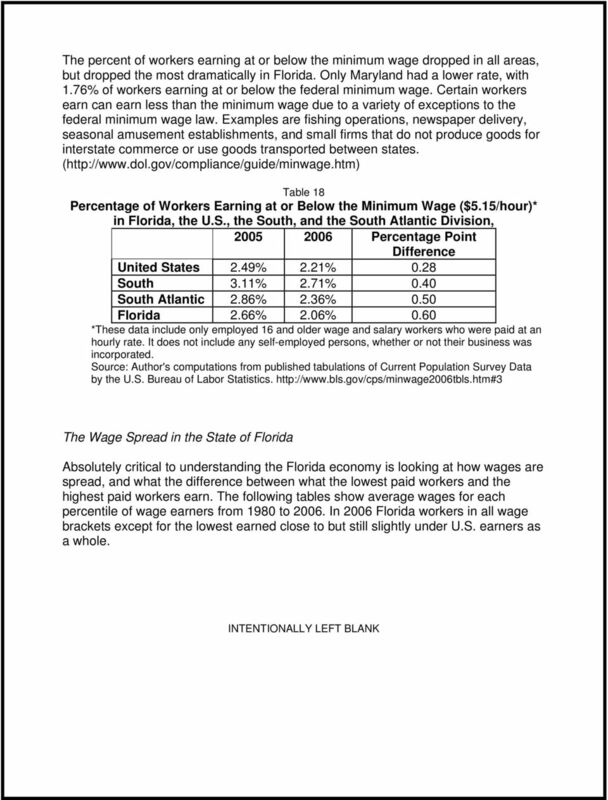 19 Table 16 Wage of Low-Wage Workers (20 th percentile) in Florida, the U.S., the South and the South Atlantic Division, Florida South Atlantic South United States 1980 $7.83 $8.02 $7.97 $ $7.53 $7.69 $7.55 $ $7.67 $8.01 $7.60 $ $7.80 $8.11 $7.78 $ $8.43 $9.03 $8.60 $ $8.74 $9.15 $8.86 $ $8.88 $9.23 $8.93 $ $8.99 $9.31 $8.85 $ $8.92 $9.31 $8.76 $ $8.94 $9.13 $8.66 $ $9.06 $9.16 $8.84 $9.10 Minimum wage What may have happened to raise the wages of low-wage workers in Florida but not the nation? The very lowest wage group, the bottom 10% of earners, is the only Florida group with an hourly wage higher than the national average. This is the first year this has been the case since Table 17 Hourly wage of 10 th percentile of wage earners, Florida and the U.S., (in 2006 dollars) United States $7.23 $6.64 $6.65 $7.38 $7.43 $7.47 Florida $6.91 $6.39 $6.49 $7.16 $7.35 $7.56 In 2004 Florida voters passed a state minimum wage law that raised the minimum wage in Florida to $6.15 per hour and indexed it to rise with inflation. In 2006 the minimum wage in Florida was $6.40. In the absence of action by the federal government on the decreasing purchasing power of the minimum wage, many states have instituted new minimum wage floors, and this likely a large contributor to the increase in the wage of the lowest paid workers in Florida. In 2007 congress raised the federal minimum wage to $5.85, and it will rise incrementally to $7.25 by If inflation continues to rise at 3% to 4% per year Florida s minimum wage will be just under $7.25 by 2009, but will surpass it thereafter, with the possible result that Florida s lowest paid workers will continue to earn slightly more than the national average for this group. 24 unemployment and underemployment is still a concern for some Florida men and women. Table 24 Florida Labor Force Statistical Differences between Men and Women, 2006 Male Female Difference Significant? Labor force participation rate 70.1% 57.5% Yes Unemployment rate 3.2% 3.3% 0.1 No Long-term unemployment share 13.8% 12.9% -0.9 No Underemployment rate 6.1% 6.3% 0.2 No Part-time workers share 13.6% 23.7% 10.1 Yes Part-time for economic reasons share 16.3% 9.6% -6.7 Yes Women are not doing as well as men when it comes to wages, however. The median hourly wage for women in Florida was only $13.06 in 2006, compared with $15.19 for men, meaning women in Florida earned 86% of what men earned. Reasons for this gender wage gap include the fact that more men are employed in higher paying occupations than women, the difference in educational levels between men and women, and that women often lose years of seniority and experience due to decisions about raising children. Table 25 Hourly Wage for Men and Women in Florida and the U.S., 2006 Male Female All Women/Men United States $16.11 $13.24 $ % Florida $15.19 $13.06 $ % The wage gap nationally is slightly larger, with women earning only 82% of what men earn. However both figures represent improvements over the past several decades, as seen in Figure 6. Real wages of both Florida men and women have increased since 1979, with women s increasing slightly faster. In 1979 women in Florida earned 70% of what men earned, compared with 63% in the U.S. overall. 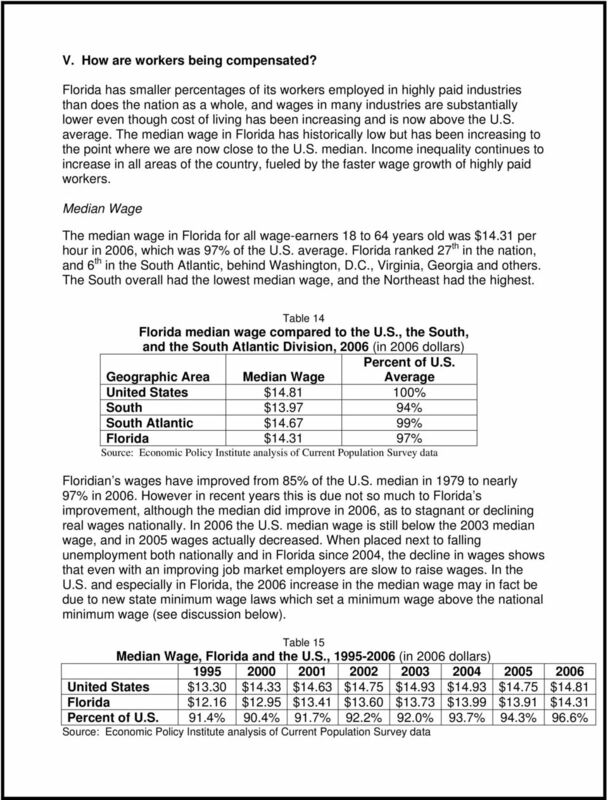 25 Figure 6 Median wages of men and women, Florida and the U.S., 1979 to 2006 (in 2006 dollars) $20.00 $18.00 $16.00 $14.00 $12.00 $10.00 $8.00 $6.00 $4.00 $2.00 $0.00 U.S. Females U.S. males Florida males Florida Females Blacks/African Americans 5 and the Florida Workforce. Just as the labor force indicators for women indicate options and choices, the indicators for Blacks indicate the opposite. More Blacks are in the labor force than Whites, more are unemployed, and more are underemployed. In addition, fewer Blacks are employed part-time although a higher percentage of part-time workers are part-time involuntarily. These figures indicate the greater pressure on Blacks to work and the barriers many encounter in pursuing work. 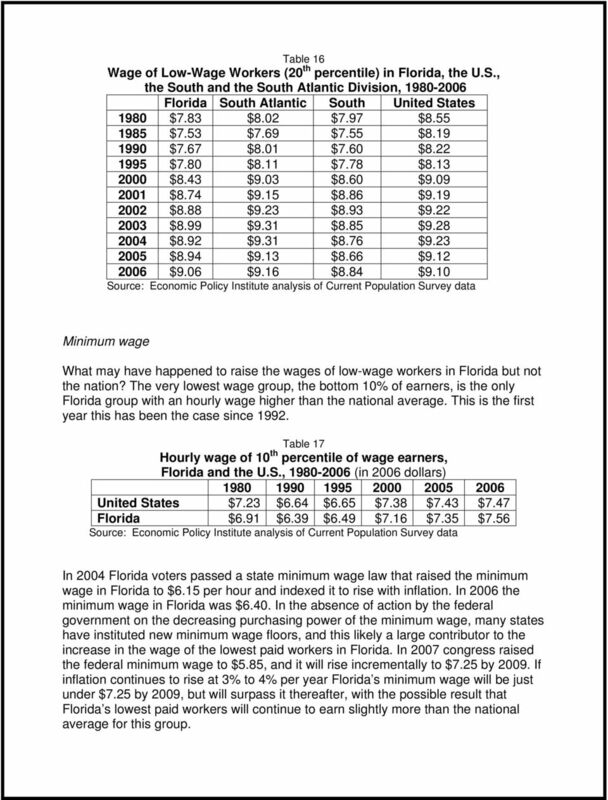 Table 26 Florida Labor Force Statistical Differences between Blacks and Whites, 2006 White Black Difference* Significant? Labor force participation rate 61.5% 65.8% 4.3 Yes Unemployment rate 2.6% 5.9% 3.3 Yes Long-term unemployment share 11.2% (a) n.a. Underemployment rate 4.9% 10.0% 5.1 Yes Part-time workers share 20.1% 16.6% -3.5 Yes Part-time for economic reasons (share of all part-time) 8.7% 16.0% 7.3 Yes 5 In the Current Population Survey respondents are asked to self-identify by race. Respondents can choose White, Black or African American, American Indian or Alaska Native, Asian, Native Hawaiian or Pacific Islander, and Other, or choose any combination of the above. Hispanic ethnicity is asked in a separate question. 26 The wages of Blacks have lagged behind whites for decades, and the gap has actually widened slightly. In 1979 Blacks in the U.S. earned 82% of what Whites made, compared with 78% in In Florida Blacks earned 81% of what Whites earned in 1979, compared with 75% in $18.00 $16.00 Figure 7 Median wages of Blacks and Whites, Florida and the U.S., 1979 to 2006 (in 2006 dollars) $14.00 $12.00 $10.00 $8.00 $6.00 $4.00 United States Blacks United States Whites Florida Blacks Florida Whites $2.00 $ United States Blacks $11.75 $11.35 $11.16 $12.27 $12.27 $12.49 Whites $14.23 $14.52 $14.29 $15.52 $15.97 $15.99 Florida Blacks $9.94 $9.98 $10.38 $11.38 $11.35 $11.97 Whites $12.26 $12.71 $13.17 $14.66 $15.53 $15.89 Hispanics and the Florida Workforce. As with Blacks, Hispanics also have higher labor force participation than whites, higher unemployment, higher underemployment, smaller part-time employment and larger involuntary part-time employment. Compared with Blacks Hispanics have lower unemployment but more involuntary part-time employment. It appears that Hispanics also have greater pressure to work and less ability to exercise choices in employment than whites. 29 Median Household Income Households can be of any size and include the income of all earners over 15 years old, regardless of whether they are related or not. In 2005, the most recent year data are available, the median household income in Florida was $44,400, compared with $47,845 in the United States. As with family income and wages in general, Floridians have historically earned less than the national median, even as cost of living has grown above the U.S. average (see table 33). Table 29 Median Household Income, Florida and the U.S., (in 2006 dollars) United States 42,207 44,788 44,767 49,159 47,845 Florida 38,142 39,915 39,077 45,490 44,400 Source: Current Population Survey, Poverty Whether a family falls below the poverty line is determined for each family based on the family s income and the number of people in the family, and every person in that family is then counted as poor. The following table shows the percent of individuals living below the poverty line in Florida and the U.S. In 2006 the poverty line was $20,614 for a family of four, and $10,294 for a single individual. Since 1980 poverty has declined, although it has grown slightly since This year poverty went down in the U.S. overall but in Florida it appears to have increased by half a percent, although the difference is within the margin of error (1.2%). Table 30 Poverty Rate, Florida and the U.S., United States 13.0% 13.5% 11.3% 12.6% 12.3% Florida 16.7% 14.4% 11.0% 11.1% 11.5% Source: The instability of Florida s poverty rate may be due to sampling variability, but the overall trend since 1980 is downward, with a rise in the mid 90s and the early 2000s. Nationally poverty appears to have declined slightly over the past year or two but it remains to be seen whether this is the beginning of a trend. In recent years poverty in Florida has dipped below the national rate, probably related to the drop in Florida s unemployment rate since 2003. 30 Figure 10 Poverty Rate, Florida and the U.S., % 18.0% 16.0% 14.0% 12.0% 10.0% 8.0% 6.0% 4.0% 2.0% 0.0% United States Florida The poverty line is based on food budgets from 1963 and has only been adjusted for inflation since that time. Since that time the costs of basic family necessities such as health care and housing have dramatically increase therefore the poverty line is no longer an accurate measure of families that are able to live self-sufficiently. A figure of two times the poverty threshold (or about $41,000 for a family of four) is closer to the true costs of family life. The percentage of people living below this threshold in 2006 was 31.1% in Florida, compared with 30.5% in the U.S. The difference is small, but the fact that Florida may have more people living below this threshold than the U.S. attests to the prevalence in Florida of traditionally low-wage industries. Table 31 Percent of population living below two-times the poverty line, Florida and the U.S., United States 33.9% 32.3% 29.3% 31.0% 30.5% Florida 40.4% 35.2% 30.6% 30.7% 31.1% Source: EPI analysis of Current Population Survey March supplement Children under 18 are the most likely to live below the poverty line, and in % of children in Florida lived below the poverty line, compared with 17.4% in the U.S. The long-term trends in Florida and the U.S. mirror those for the overall poverty rate (see figure 10). 31 Table 32 Percent of children under 18 living below the poverty line, Florida and the U.S., United States 18.4% 20.6% 16.2% 17.6% 17.4% Florida 25.5% 25.4% 16.7% 15.8% 14.6% Source: EPI analysis of Current Population Survey March supplement Housing Cost A major factor in the economic well-being of families is the cost of housing. Housing prices and rents have risen considerably in Florida in the last several years, which places an increasing burden on family incomes. When a household pays more than 30% of its income in housing costs that household is considered to be cost burdened. In % of Florida households were paying more than 30% of their monthly income in housing costs. Table 33 shows the percent of households that are cost burdened by income level. Fully three-quarters of households making less than $20,000 annually are cost burdened, as are over half of households making less than $35,000. At all income levels except the highest, a larger percentage of Florida households are cost burdened than in the U.S. as a whole. Table 33 Percent of Households Paying more than 30% of Monthly Income in Housing Cost by Income Level, Florida and the U.S., 2005 Florida United States Less than $20, % 72.7% $20,000 to $34, % 42.0% $35,000 to $49, % 22.5% $50,000 to $74, % 18.4% $75,000 or more 10.2% 12.2% Source: American Community Survey 2005 Cost of living Florida is usually thought of as a state with a relatively low cost of living, however of the twelve metropolitan areas surveyed by the American Chamber of Commerce Researchers Association six have costs of living above average (100 for the U.S.). Based on the population of the selected areas, the weighted average cost of living for Florida is 107.6, almost eight points above the national average.